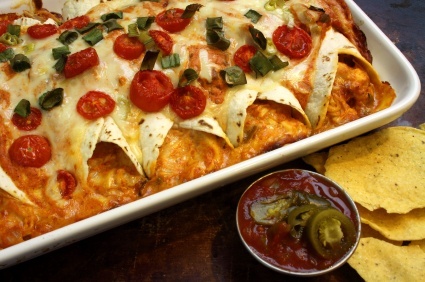 My green chicken enchiladas are outstanding with homemade green chile enchilada sauce. I can't believe how easy it is to make this dish and enchilada sauce. PREHEAT oven to 350 degrees (175 °c | gas mark 4). each tortilla filled with 1/8 of the shredded chicken, 1 ounce of cheese and arrange in the pan. with foil and bake for 45 minutes. Uncover and bake additional 15 minutes until the cheese is light brown and bubbly. Serve with fresh chopped tomatoes, cilantro, sour cream and hot sauce. PREHEAT oven to 400 degrees (205 °c | gas mark 6). Line a rimmed baking sheet with parchment paper and arrange the chiles in a single layer. Roast chiles for 25 minutes. Transfer to a bowl and cover for at least 15 minutes. When chiles are cool enough to handle, remove the stems, skin and seeds; coarsely chop. Heat olive oil in a large saucepan over medium-low heat. Add the white onion, garlic and jalapenos; cook until soft stirring often. Add the chopped chiles, cumin and water; cover and simmer for 10 minutes – stirring occasionally. Season to taste with sea salt and pepper. Blend this mixture in two to three batches in the blender covered with a towel if the mixture is hot. Pour sauce into heat-safe container and let cool. Use half of this in the recipe above or freeze sauce. Makes 7 cups.